Seven different squirrel species live in Illinois, all belonging to the taxonomic family Sciuridae, three of which are ground squirrels. While these species are often found in forests, parks and woodlands, you also might spot them in urban or suburban areas, especially in gardens. Some unusual specimens can be found in Illinois, including eastern gray squirrels who are actually all black or all white, and flying squirrels who can glide long distances between trees. The smallest of all tree squirrels found in Illinois, southern flying squirrels (Glaucomys volans) weigh an average of 2 pounds and measure roughly 9 to 10 inches in length. While they can't technically fly, they have flaps of skin either side of their bodies, extending from their wrists to their ankles, that allow them to glide from tree to tree for more than 250 feet. They have large eyes for their size, with gray-brown fur on their backs and white fur on their bellies. 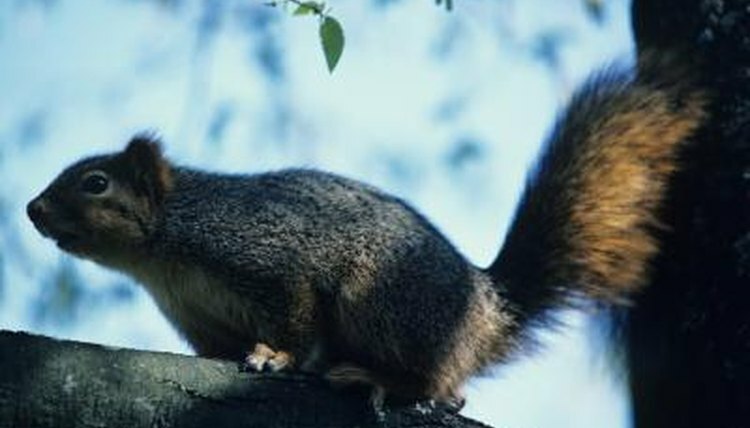 Weighing in at between 1 3/4 and 2 pounds and measuring 19 1/2 to 22 inches long, fox squirrels (Sciurus niger) are the biggest of all squirrels who live in Illinois. Their fur is buff to orange in color and they have fluffy tails, often developing large ear tufts in the winter. They're usually found in either deciduous or mixed forests, where they forage for foods such as nuts, seeds, insects, leaves and eggs. As their name suggests, eastern gray squirrels (Sciurus carolinensis) are usually gray in color. However, both all black -- or melanistic -- and all white -- or albinistic -- varieties can be found quite commonly in some parts of Illinois, as a result of naturally occurring genetic mutations. They usually weigh round 1 1/4 pounds and measure from 17 1/4 to 18 1/4 inches in length. Red squirrels (Tamiassciurus hudsonicus) are only found in the northeastern counties of Illinois. Although these arboreal creatures like to live in coniferous, deciduous and mixed forests, they can be found in both urban and suburban areas. On average they weigh just two-fifths of a pound and measure between 11 1/2 and 13 1/2 inches long. Their coats are a distinctive deep red in color. Three species of ground squirrel make their homes in Illinois: eastern chipmunks (Tamias striatus), thirteen-lined ground squirrels (Spermophilus tridecemlineatus) and Franklin's ground squirrels (S. franklinii). Eastern chipmunks are the smallest of Illinois' ground squirrels, measuring roughly 8 to 12 inches in length and weighing 2 to 4 ounces. Much bigger than eastern chipmunks, thirteen-lined ground squirrels are 8 to 9 ounces at their peak weight. Larger still, Franklin's ground squirrels weigh 1 to 1 1/2 pounds before they go into hibernation. What Does an Australian Koala Bear Look Like?